Some 320 million years ago, the earliest reptiles appeared, arising from amphibians, with lungs, more muscular legs, and laying hard-shelled external eggs that could better withstand land than the amphibian’s water-bound eggs. Reptiles would enjoy their prominence during the Mesozoic era (250–265 million years ago), fittingly called the Age of Reptiles, when they were the most numerous and dominate vertebrates. After this period of pre-eminence, only sea turtles, crocodiles, snakes, and lizards were left, with lizards representing over 95 percent of extant reptiles. Reptiles are amniote (tetrapods that lay eggs on land, excluding birds and mammals), which have scales or bony exterior plates, and are ectothermic, relying on external sources to provide their body heat. The oldest reptilian fossil remains, dating back 315 million years, were found in Nova Scotia, and consist of a series of footprints, made by a lizard-like animal, 8–12 inches (20–30 centimeters) in length. Among the earliest groups of reptiles were the diapsids, characterized by a pair of holes on each side of their skull. The diapsids gave rise to two branches: the lepidosaurs and the archosaurs (saur = lizard). The lepidosaurs include the lizards, snakes, and tuataras, the latter, a lizard attaining a length of about 39 inches (1 meter), which once inhabited many parts of the world, but now solely resides on coastal New Zealand islands. The most impressive lepidosaur was the mosasaur, an extinct marine reptile resembling the monitor lizard that could attain a length of 57 feet (17.5 meters). It was quick, agile, and the dominant marine predator for almost 20 million years. Two prominent archosaurs were the pterosaurs and dinosaurs. The pterosaurs (formerly called pterodactyls) were the earliest vertebrates that had mastered powered flight. They were the largest flying animals of all time, having a wingspan of 40 feet (12 meters); the smallest of the 120 species of pterosaurs was the size of a sparrow. Their bones were hollow, like that of birds, and their extremely long fourth digit provided support for a wing that was unlike those of bats and birds. Pterosaurs first appeared some 215 million years ago and thrived for 150 million years before becoming extinct. SEE ALSO: Amphibians (c. 360 Million BCE), Dinosaurs (c. 230 Million BCE), Birds (c. 150 million BCE), Paleontology (1796), Thermoreception (c.1882). 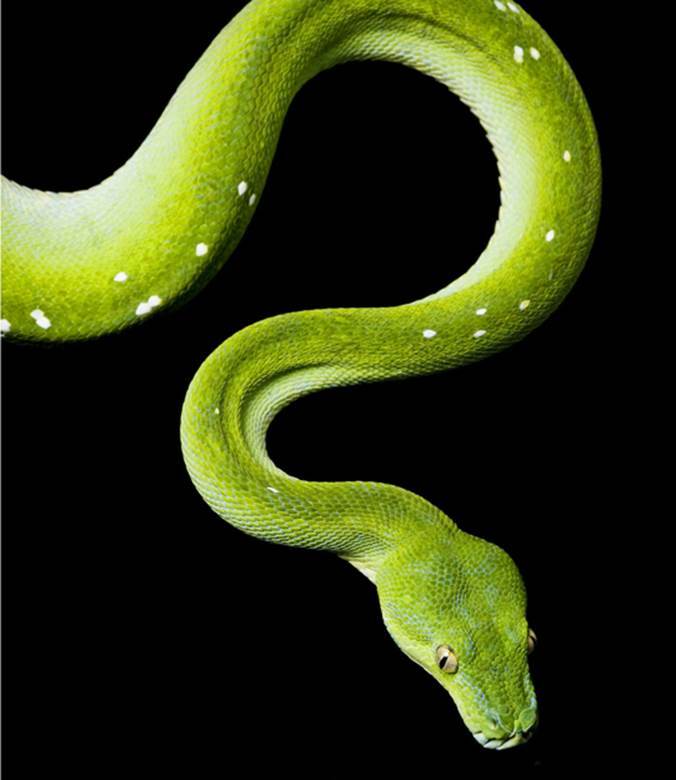 The green tree python is found in New Guinea, Indonesia, and Cape York Peninsula in northern Australia. This python can reach more than 6 feet (180 cm) in length and resides in a distinctive coiled position around tree branches.